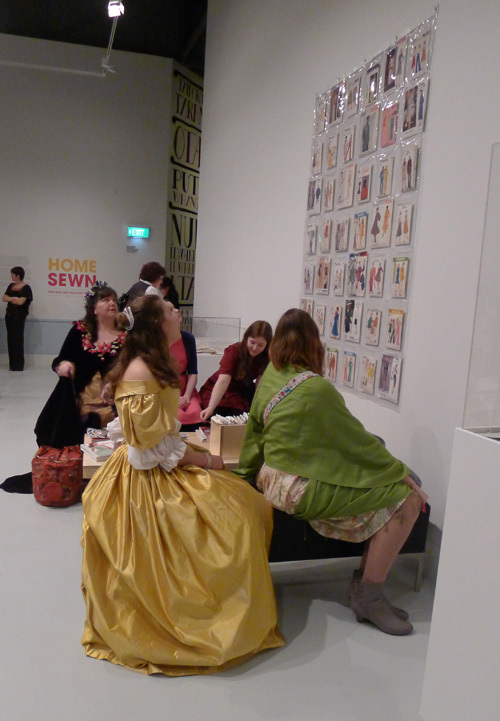 Last night, I went to the hectic opening of “Home Sewn” at the Dowse Art Museum – an exhibit profiling the home creators and designers of clothing in New Zealand. Home sewing was a huge part of fashion in this remote isle until very recently, so this exhibit of the finest Kiwi home stitchers have to offer is amazing. 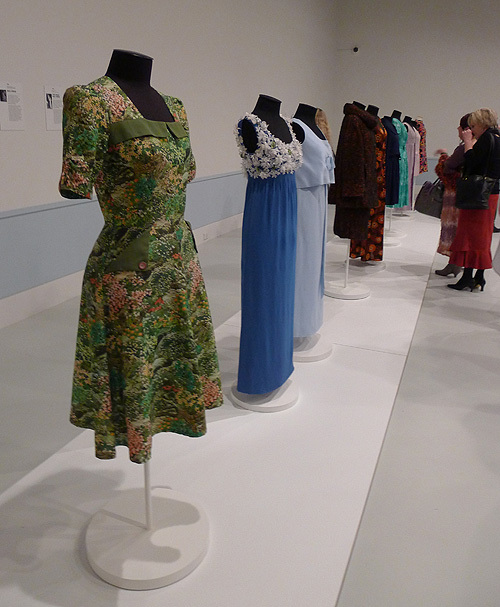 The exhibit is free, and you should go, if you like dresses. 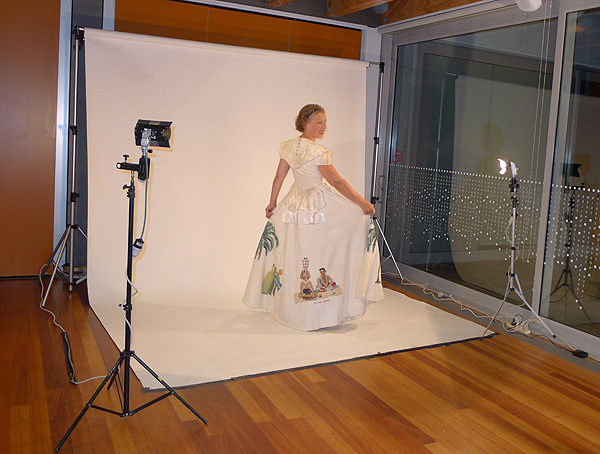 This outfit, sewn and hand-painted with scenes of Samoa by the artist’s mother, won one of the prizes bestowed by luminaries including the designer and historian Doris du Pont. 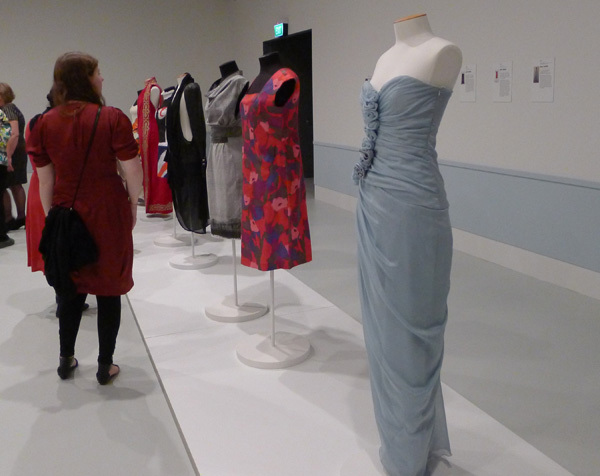 After our self-made fashion show, we were the first ones to see the exhibit – a vast cool room full of dresses from the 1930s to 2011, all made by New Zealand home stitchers. Yes, Archival People, I turned my camera flash off for these first-view shots. 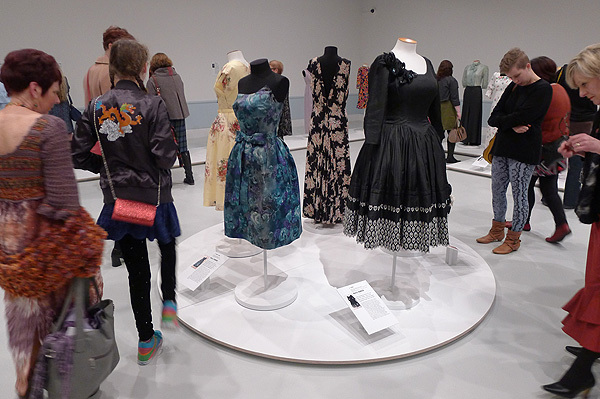 I love the contrast in this photo between the 1950s dresses and the contemporary viewers. The 1960s side of the exhibit. 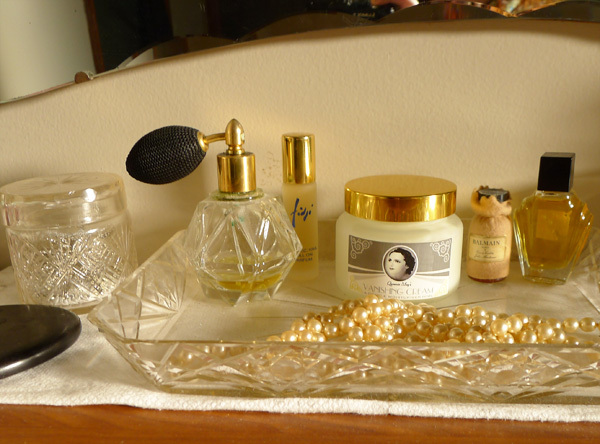 Dresses from the 21st century – though you might not have guessed that at first, looking at the 1950s-esque eau de nil chiffon and the vivid retro sheath. 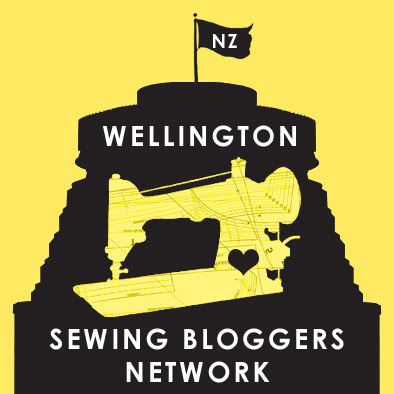 Writers and creators from the Wellington Sewing Bloggers Network got stuck into the pattern corner. 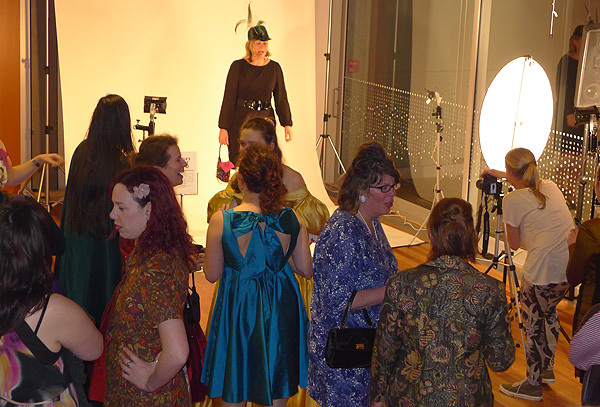 Tomorrow I’ll have shots of the attendees in their self-made garments, so get ready for another picture-weighty post. A weekend or so ago, I took a flying visit to Auckland, indulging in a Saturday to roam around several neighborhoods (K Road, Ponsonby, Herne Bay) and reconnect with some old friends before they left New Zealand. Here’s some of the great places I visited…and one or two not-so-great ones. Cherry Bishop dress, retro cut, in Japanese cotton with – are you ready? – BUNNIES. Cherry Bishop’s store in Herne Bay is stocked with well-cut retro-style dresses she’s designed. Two points of difference here: her skirts are flatteringly pleated into waistbands, not gathered. 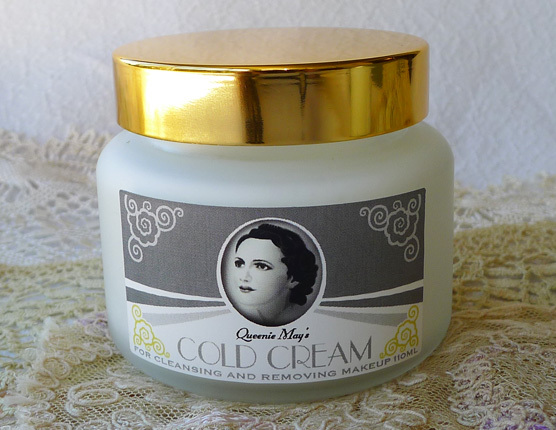 I prefer this tremendously – it makes the dresses more polished and flexible. 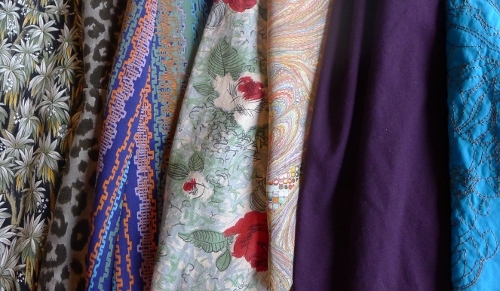 And she picks out delicious fabrics that you won’t see on 200 other retro-istas, including Japanese cottons and patterns with New Zealand flair. 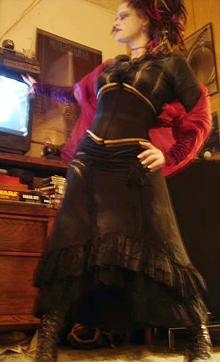 The velvets of her winter dresses are thick and scrumptious, too. Annex boutique on Ponsonby Road is unexpectedly charming, with stylish foundation pieces like Three Dots and Petit Bateau tees and knitwear, and chic French hair clips and barrettes. “I try to have things you can’t get online,” says the smiling owner. 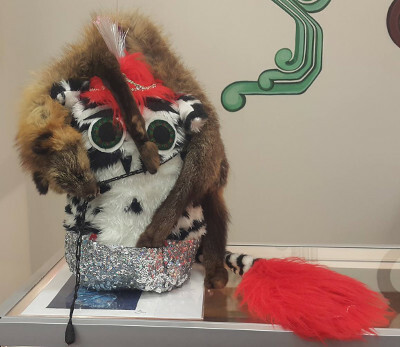 Avant-garde Scotties boutique has both Auckland and Wellington branches. In Auckland, tucked away in Herne Bay, they have a small branch with a high-end recycle boutique. The sale rack there had some fantastic deals for $100 and under. Not so great: K Road…otherwise known as Karangahape Road, the local “alternative” hipster strip…it’s also lost several places that gave it charm, like excellent used bookstores and fabric shops. I’ve outgrown the trendy t-shirt and unremarkable vintage stores that remain. And Nostalgia Restaurant, also known as Prohibition, is certainly a beautiful locale. A friend and I, asking if we might have afternoon tea despite our jeans, were dumped at a table outside by an icily soignee woman, who gave us a grubby drinks menu and…ignored us. Not even ow! Honestly, “sorry, ladies, we have a dress code,” would have been better. Luckily dreamy Jafa Cafe washed the bad taste out of my mouth. From the lushest pancakes ever seen to vegan raw food platters, they have something for everybody, and it’s casual-as. 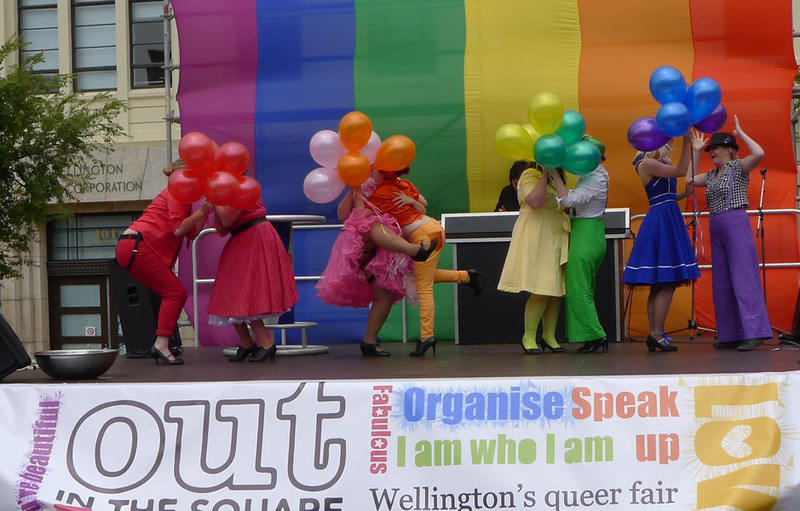 Photo post – the Rainbow Troupe’s second performance, and some burlesque and retro style, all at Wellington’s 2013 Out in the Square GLBQT pride day. Miss Honey Suckle as lady Elvis rocked our socks and shook her famous “assels”. Sharing a kiss behind the balloon bunches, right before letting them fly to the skies! Cleverly, they’re in the reverse rainbow order of the backdrop behind them, so they stand out brilliantly. This year we had both femme beauties and butchy babes for a lighthearted burlesque vision of the 1950s as they should have been. 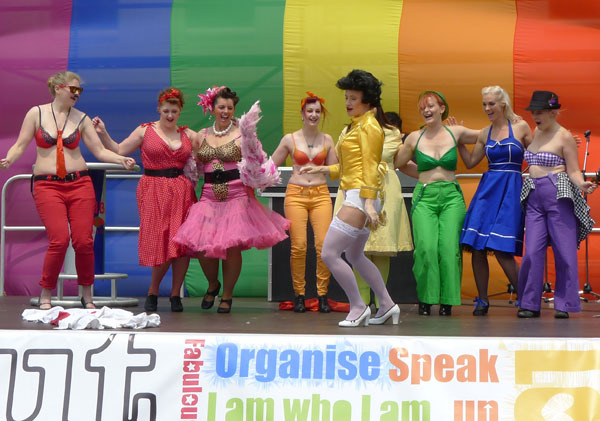 Yes, I coordinated/produced the Rainbow Troupe again for 2013, with serious production support from Winnie Chester. And what a troupe it was: Salacious Sugar, The Velvet Whip, Atomic Ruby, Miss La Belle, Flic Caracou, Ula Vulk, The Deity Dollicious, and The Purple Rose were our living rainbow, and we had a guest appearance from lady Elvis brought to us by Miss Honey Suckle. More than a few people came by Civic Square especially to see the performance. 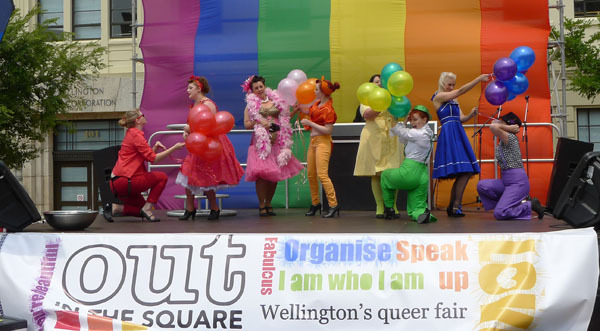 Thanks to the whole Out in the Square team for making it go like buttah! 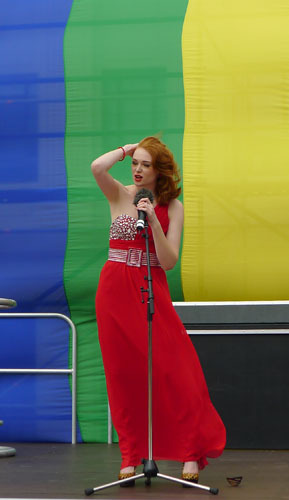 This stunning burlesque chanteuse shared the stage with us. We’ll be seeing more of her in Wellington! Young volunteers mixing up vintage plus. 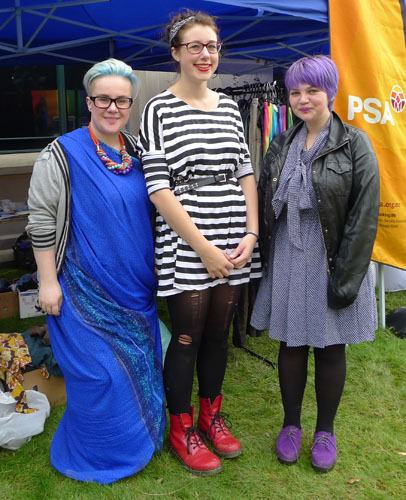 They were staffing one of several vintage clothing booths – some real bargains out there. 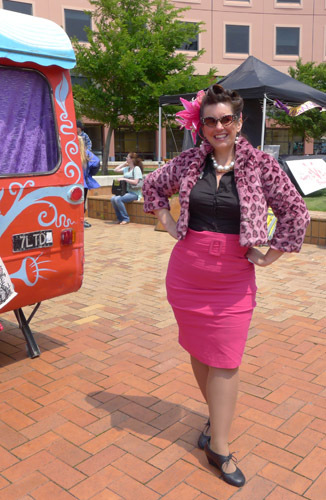 Edgy burlesque performer Candy Thorne livens up a windy Wellington day. Miss La Belle, burlesque star and teacher, relaxing after her first performance of the year. Look out for Post #2 with more great style and atmosphere shots! I’ve been friends with American Magpie for 24 years! 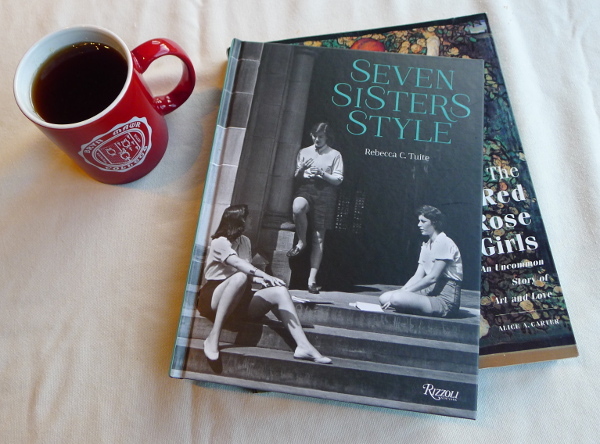 It was delightful to hear from her when she got in touch to ask about vintage style for special occasions. 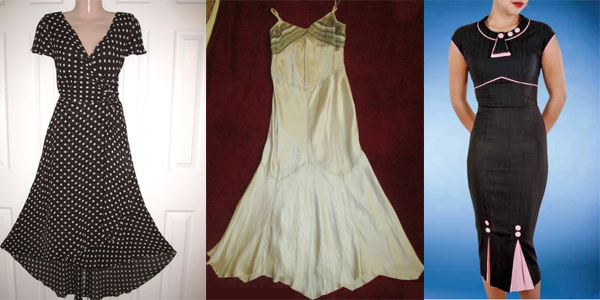 I would like to start the process of amassing some wardrobe pieces in a 1930s style (dresses, mainly). I’m looking for fairly simple ones, not high fashion examples of the genre, but ones with a nice drape that show off my, um, hour-glassiness, to good advantage. I’m really not a dress-up person – work clothes are mainly dark trousers, a nice blouse and a scarf, and I grub around in gardens and on hiking trails enough that casual clothes are still jeans and tshirts. But on occasion I do like to dress up and I prefer the simple dress, seamed stockings, hat and a coat look to more contemporary styles. Can you recommend places (on line, preferably) where I could look for clothes like these? I suspect it would be much easier if I could just make them myself, but I don’t have a sewing machine, or a room (or a table,even) to devote to learning how to do this. 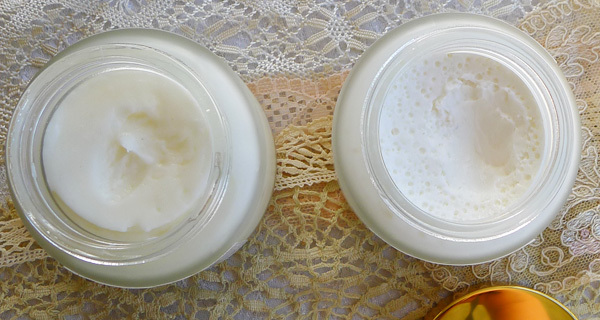 Maybe down the road, but not now … so I’m looking to buy things ready-made. Any ideas? 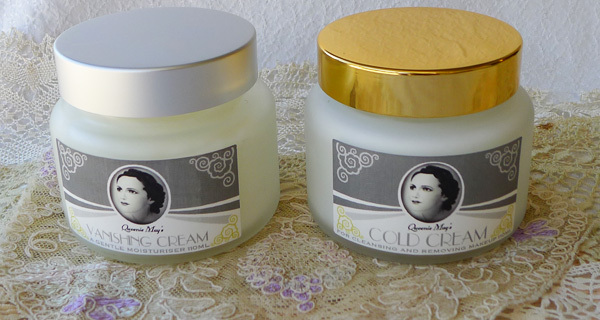 Hi hon, oooh, the 1930s look! So lovely, so troublesome…the 1930s were when modernism really hit its stride sartorially, and fabric prints and tailoring veered off in lots of quirky directions. Personally, with my curves, I am a 1940s gal. 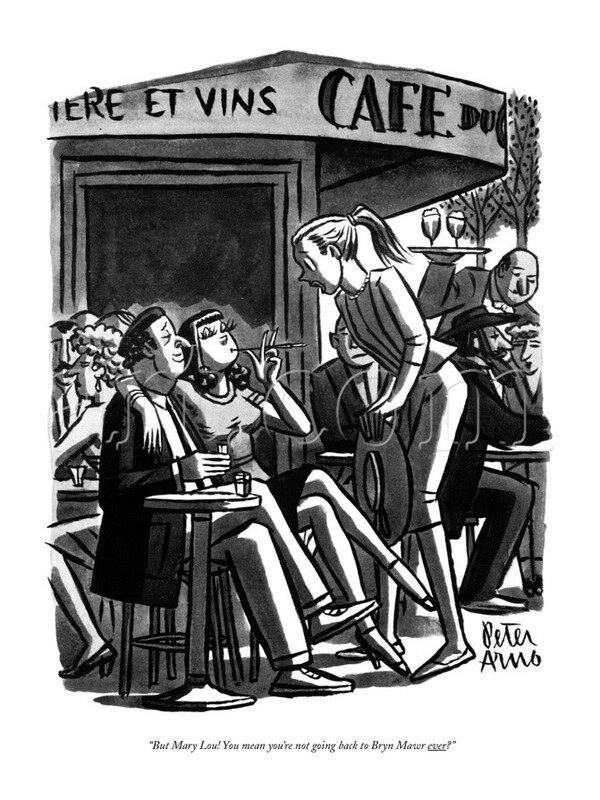 But if you want the 1930s, then by the Goddess, you shall have it. 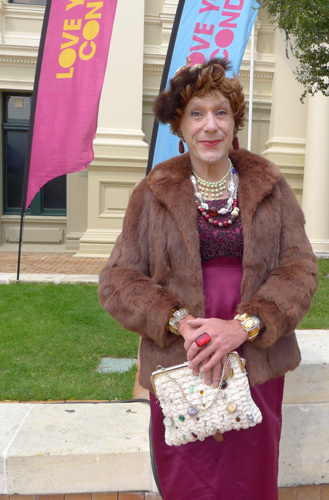 It just so happens that here in New Zealand, we are coming up on Art Deco weekend in Napier, and so lots of us here in the Antipodes will be getting their 1930s on as well. 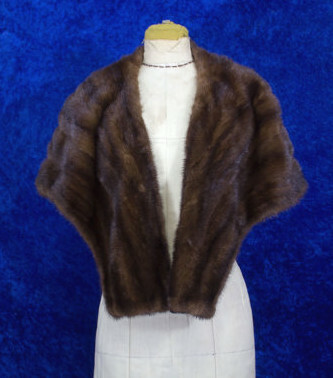 This is a good website to just get ideas about the 30s look: Fashion-Era. And here’s another one: Giant Pants of the 30s. In the 1930s you would have day dresses – a range of dresses or outfits worn during the daytime – and, if you were so lucky, evening dress. Day dresses had hemlines between the knee and the calf, most of the time – the flapper’s naughty hemlines were over – usually had sleeves, and were often accesorized with a hat and gloves. Smart suits were also worn during the day, made of fabrics from wool crepe to tweed. Chanel got started with her suits in the 1930s. Evening dress was made of more glamorous fabrics, and accessorized with jewelry, long gloves, and corsages. 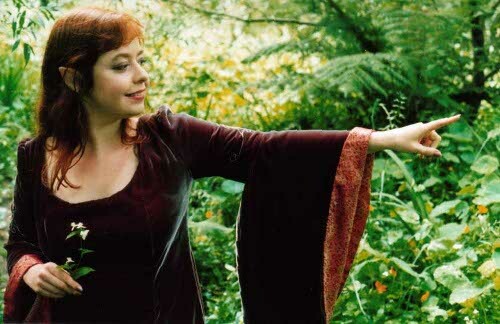 I’ve had a long, bias-cut, 30sish black evening dress in my wardrobe for 20 years. It still fits (just!) and still gets worn. Blog inspiration can be found at SammyD’s Vintage (overview with hints), Kitty’s Vintage Kitsch (tutorial!) and The Dreamstress. I shared The Dreamstress’ “Gran’s Garden” 1930s dress with American Magpie, who said it was just the thing, but that she couldn’t sew. Now, where to find these looks ready-made? To evoke a 1930s garden party for under $75 US, my #1 recommendation is going to be hitting up consignment stores or eBay. Tea-length floral silk/rayon dresses and tea-length skirts, bias-cut or pleated, are not at the top of the fashion hit parade at the moment, which means consignment/eBay is a great source. 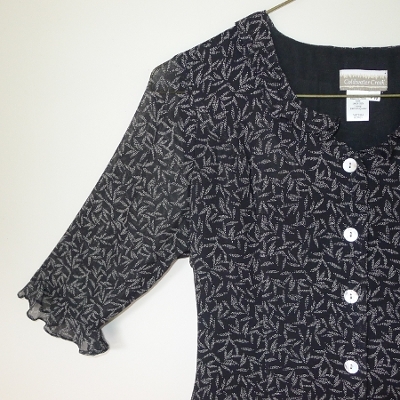 Vintage Coldwater Creek and Liz Claiborne, in rayon or silk, often has lovely 1930sish lines. 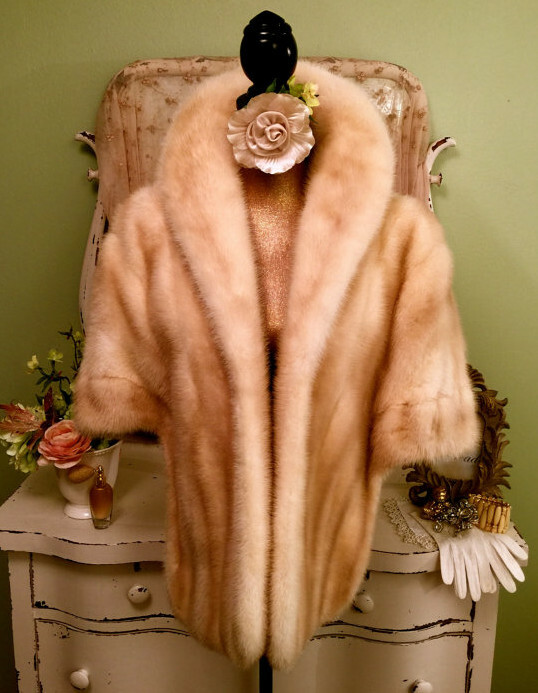 There was an Art Deco revival in the 1970s, so to find ’70s vintage that looks ’30s, search on “does 30s” or “does 1930s” to find 70s-does-30s and 80s-does-30s styles. A range of 30sish EBay finds: Laura Ashley “day dress”, Karen Millen evening dress, and Stop Staring dress that could be day or evening. If you want to spend between $100 and $200 US, there’s a site called Trashy Diva that does ravishing retro dresses, and their Obi dress, on sale now, has a great 30s-like line. I am happy to vouch for their fabrics and say that this would be a fab investment special occasion dress, flexible for all kinds of events. Looking around, I also found some appealing, well-priced reproduction 30s and 40s dresses at Stop Staring, Heyday, and ModCloth. And, of course, there are custom vintage reproduction dresses galore on Etsy – their 1930s selection seems skewed towards cotton daywear. 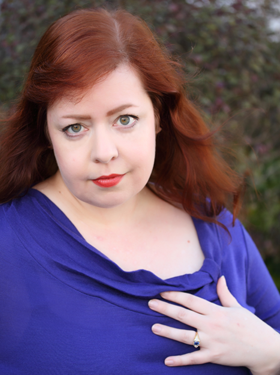 I recommend Heart My Closet, especially the Ivy, Darcy, or Serena pencil dresses. Because they are custom made you can request a tea-length skirt, which takes them to the 1930s. The Dreamstress also takes commissions, if her schedule allows. We tend to focus on dresses, for some reason – we’re all in love with the idea of the magic dress – so I encourage you to consider top/skirt combinations. If you have curves, it can be far easier to find a great-fitting top/skirt combination than it is to find a bias-cut dress that fits just right. For a true 30s look, necklines were high, and most blouses had some sleeve. 1930s skirt ensembles from a pattern. For some retro-flavored tops and skirts, here’s a stealth source: Pendleton! The Tuck it Up, Tie Front, and double-breasted blouses look great to me. (I find vintage Pendleton on eBay less appealing than their new stuff,) I also love this tie-neck knit top from Talbots. Both Pendleton and Talbots have lots of petites, recommended because I know American Magpie is, like me, petite in height. Strikingly retro Pendleton tops from their current sale. Shoes and accessories can take clean-lined contemporary clothes in a vintage direction. 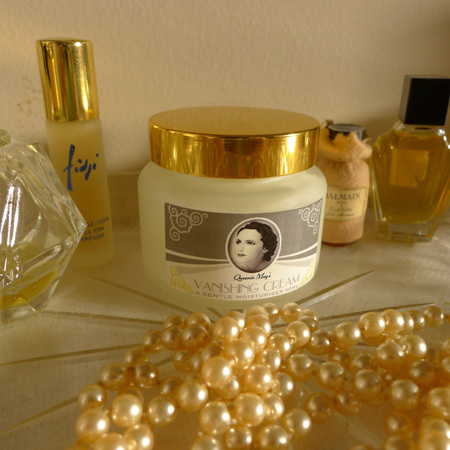 How about investing in some vintage 30s jewelry – such as Bakelite bangles, Czech glass necklaces, paired rhinestone dress clips, brooches for coats or dress/blouse lapels, Trifari costume jewelry, rock crystal necklaces. The 1930s were not one of the great jewelry eras, due to the Depression, so I’d add 1920s and Art Nouveau necklaces and bracelets to the mix. Pearls have never been more affordable thanks to Chinese pearl farmers (eBay, Fire Mountain Gems, your favorite local bead store). Rennie Mackintosh silver, and silver and marcasite jewelry, are also perfect for the Art Deco look. 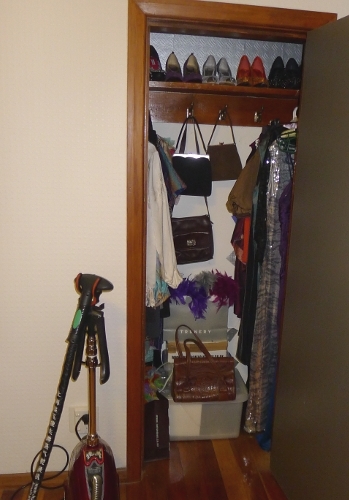 To avoid overdoing it with gloves, hats, jewelry, scarves, costume jewelry, etc. 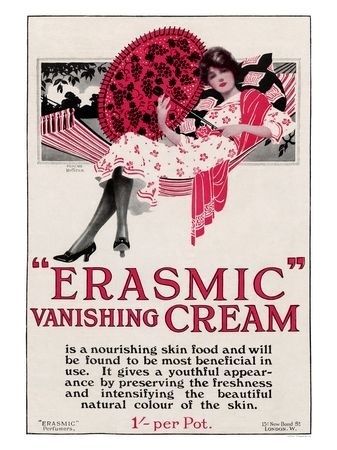 when they were all worn more frequently, a lady would get dressed, put on her acessories, and then take one accessory off. Also, for a true 1930s look, stick with smooth body-toned hosiery, possibly with seams. 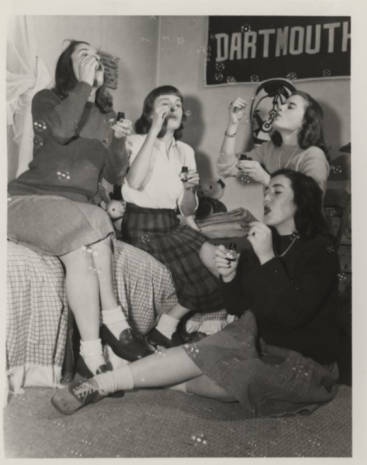 Fishnets were trampy back then! Lastly there’s yet another Art Deco revival happening out there – you can thank the upcoming Great Gatsby movie for that – so I would look in your favorite stores this season for Art Deco-flavored tops to team with skirts or Giant Pants. 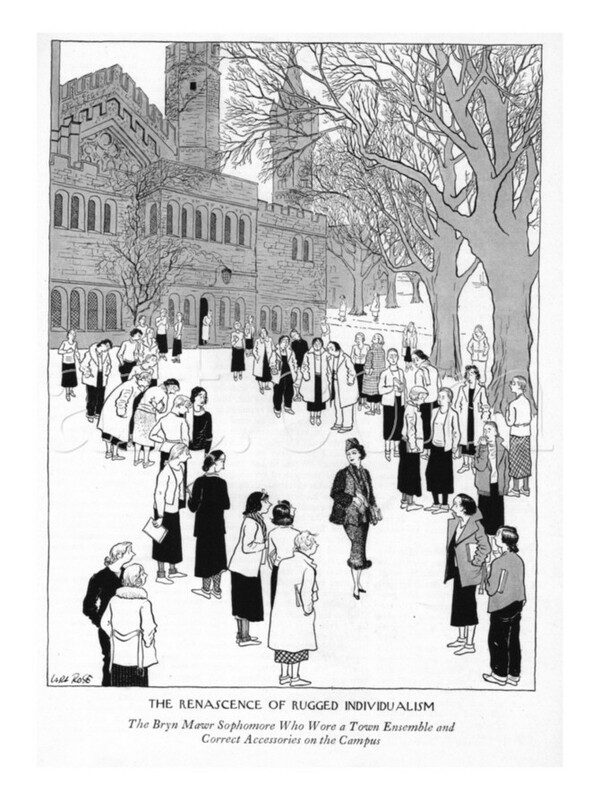 I know I just recommended this book in another recent post, but I Capture the Castle has a lot of commentary about women’s clothing in the 1930s. It’s also a great story that you can share with your stepdaughter. Coda: After more conversation, and an exchange of photographs and measurements, I mailed American Magpie a vintage silk dress that was waiting patiently in my closet, in an international clothes swap. Here’s a picture of the dress. The long lines, ditsy print, and fine chiffon ruffles give it a 1930s feel. 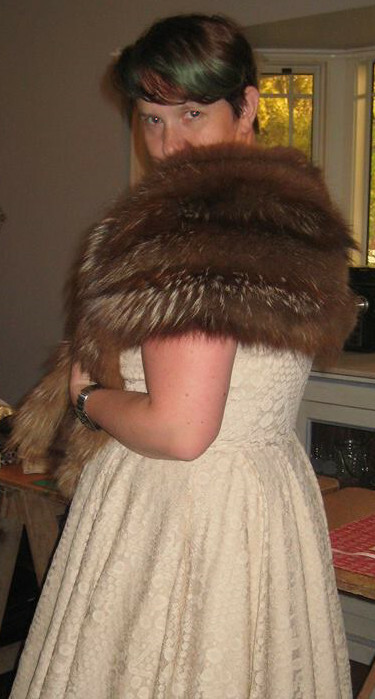 A 30s-ish dress that’s about 10 years old. Silk chiffon/light crepe, with pearl shell buttons.